There is a small concern that Carlos Martinez might struggle this season, to which I say: Hogwash. Two reasons he’ll be fine, both of which are mental, as he has the stuff. Quite a few hitters/pitchers have do, it’s just that the mental side often gets in the way. He’s dedicating this season to his lost friend, so that’ll help his focus for this season. Plus Oscar’s death hammers home the fact that our time here is fleeting and will so we need to do our best in the time we have, both on and off the field. 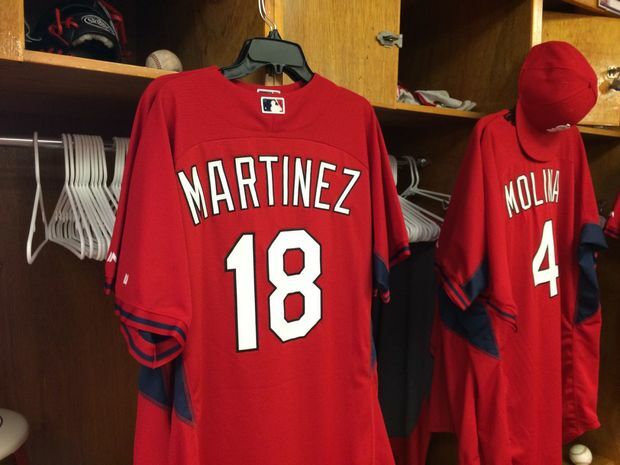 As you can see in the featured picture, Yadier Molina had Carlos’s locker placed next to his for spring training, a sign that he’s taking the young pitcher under his wing this year. I personally can’t think of a better mentor for a young pitcher than Yadi, and I think his guidance will help the kid have a good first year as a starter. Yadi will help Carlos by showing him mistakes in a positive way, as things to learn from. He’ll get inside the kid’s head and boost his confidence when it’s needed. Between those two things, Carlos’ focus will be razor sharp. I not only expect him to certify his position as our fifth starter in spring training, I expect that focus, with help from yadi, will be maintained throughout the season and he will have a good season, surpassing many of the numbers the prognosticators have projected for him. That could be me just shooting for the moon, but I honestly believe it will happen, given who is guiding him. Plus it doesn’t hurt to have Adam Wainwright as another mentor in the clubhouse either. Between him and Yadi, the kid’ll be just fine.